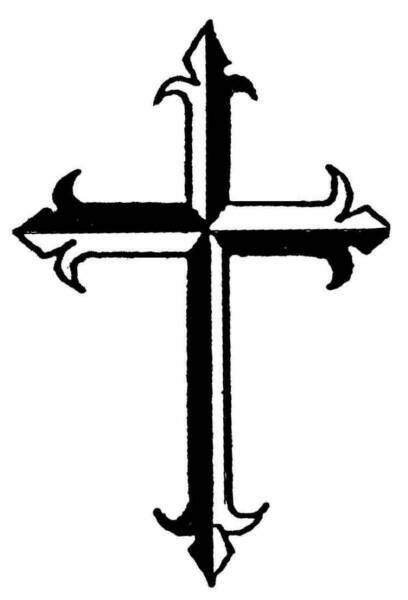 Today is the 62nd anniversary of the monastic foundation of Our Lady of Grace Monastery in North Guilford, Connecticut. Faithfilled nuns made the journey from a Dominican nun’s monastery in Summit, New Jersey to a suburb of New Haven in 1947 to spend their lives for the Gospel and the Church. I am grateful for the presence of the monastery because it has offered me a place to pray, that is, to enjoy the friendship of Jesus and His Mother, Mary. 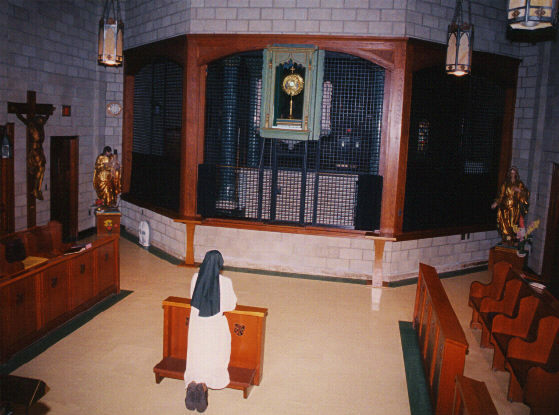 Nuns have perpetual adoration before the Blessed Sacrament open their chapel to countless visitors who want to do the same; there is a possibility of making other spiritual exercises like the Stations of the Cross. The nuns support themselves entirely on the donations they receive and the income from a modest bookstore. The context of Our Lady of Grace Monastery is in the Archdiocese of Hartford, 15 miles from New Haven and priests from the Dominican Priory of Saint Mary’s, New Haven. The value of prayer and sacrifice was learned early in my life through the nuns of this monastery. Now with the Lord, Sisters Mary Dominic and Veronica used to sit with me talk about life and God. Over the years I made a regular pilgrimage (really a short trip from my parents’ home 12 miles away) to the monastery because it was interesting, even mysterious. How many places do you that beckon you to know Christ? As a teenager I would ride my bicycle to the North Guilford monastery to serve the Sunday Mass celebrated by Father Luke and then ride all the way home again. 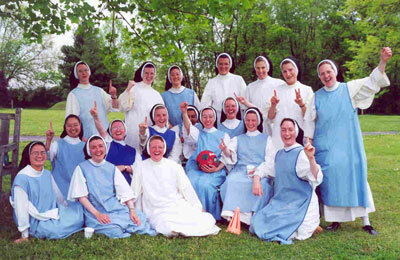 I count on the witness of these nuns because I trust it. Our Lady of Grace Monastery is not sentimental; it’s not fake, it’s not transient; the lives of the witnesses are rooted in Jesus Christ. Would that all of us could say the same. Would that the witness of these nuns could rub off more so that we could give be the face of Christ in the world. WASHINGTON — When five Dominicans were ordained on May 23 at the Dominican House of Studies in Washington, D.C., it was the fruit of a long process. The Order of Preachers, whose religious and priests are commonly called Dominicans after their founder St. Dominic, took a high profile role in Pope Benedict XVI’s U.S. visit. And their profile is only getting higher. 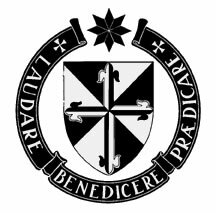 The Dominican House of Studies — the order’s prominent seminary in Washington, D.C. — recently announced plans to build a new academic center and theological library, confirming an increase in vocations and a broad expansion of the order. 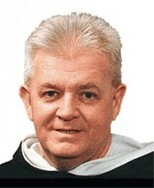 The Dominicans’ long-standing reputation for forming highly educated religious and priests appeals to many called to vocations these days, but study alone is not the draw, said Father John Langlois, master of students at the Dominican House of Studies. To that end, the study of St. Thomas Aquinas — one of the Church’s master theologians and a Dominican himself — is an important emphasis for those in formation. The new priests for the Dominicans are: Father Martin Philip Nhan, Father Pius Pietrzyk, Father Hugh Vincent Dyer, Father John Martin Ruiz-Mayorga, and Father Thomas Joseph White. There are as many stories as there are Dominicans. Even the order’s prayers, while deeply liturgical and traditional, have their own ring to them. 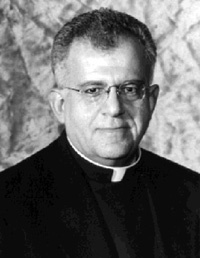 This unique path within the living tradition of the Church comes down from the establishment of the order, said Father Gabriel O’Donnell, vice president and academic dean of the pontifical faculty of the Immaculate Conception at the Dominican House of Studies. The same charism cannot be mirrored in diocesan formation, which prepares a man for a way of life he carries with him from one parish to the next. Brother Austin Litke, who’s finishing his second year of theology at the Dominican House of Studies, agreed. The common life is, in fact, what drew Brother Austin to transfer to the Dominicans after studying for five years in diocesan seminaries as a collegian and first-year theologian. Brother Austin also agreed that study integrated with prayer and the common life takes a different kind of dedication. How seminarians are guided along that path — how their formation is administered, in other words — is a question specific to their ministry, said Father Stephen Boguslawski, president of the Dominican House of Studies and executive director of the John Paul II Cultural Center. “The diocesan rector establishes the general tone of the seminary; he oversees the whole operation,” he said. “He stands in for the bishop, and that means a high concentration of administration in one person. In Dominican formation, those responsibilities are diversified; I, for instance, oversee the intellectual development as well as our own” plan of studies. That expansion of responsibility extends down through the ranks, with the newest seminarians learning directly from Dominicans ordained for decades. Father Boguslawski also mentioned the importance of reaching youth. In the meantime, the Order of Preachers will continue to serve according to their charism. Sydney, Australia, to help plan and organize World Youth Day has led to a new mission in Australia for the congregation. The three — Sisters Mary Madeline Todd, Mary Rachel Capets and Anna Wray — are members of the St. Cecilia Congregation in Nashville. They have returned home but two of them will go back to Sydney to help establish their community’s first permanent mission outside the United States. Cardinal George Pell and Auxiliary Bishop Anthony Fisher of Sydney, a fellow Dominican, “we’re eager to have our sisters working in Sydney,” said Sister Mary Madeline. “What we could offer and what they needed were complementary.” What the Dominicans offer and what is needed in southern Australia, Sister Mary Madeline said, is a “witness of religious life.” Although Australian society has become increasingly secular, “there is a great interest in religious life in Australia,” Sister Mary Madeline told the Tennessee Register, newspaper of the Nashville Diocese. On another note, the Nashville Dominicans finally professed 11 sisters on July 25th. May God grant many years! The nuns need our prayerful solidarity, vocations and material support. 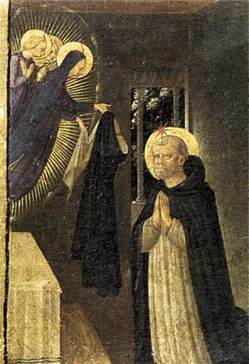 What’s more beautiful than a life dedicated to following the Gospel of Jesus Christ in the charism of Saint Dominic by faithfulness to a life of sacrifice, worship, study and community life? The nuns live what is considered a traditional Dominican nuns’ life with the night office, the traditional habit, community life and abstinence. Their life is not easy but they it is beautiful, happy and rewarding. 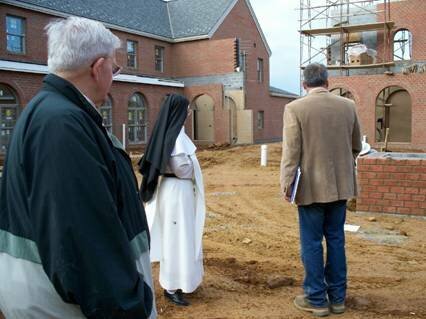 The monastery will be blessed (dedicated) and the nuns formally enclosed by the bishop of the Dicoese of Arlington, The Most Reverend Paul Stephen Loverdi on October 7, 2008, the feast of the Holy Rosary. 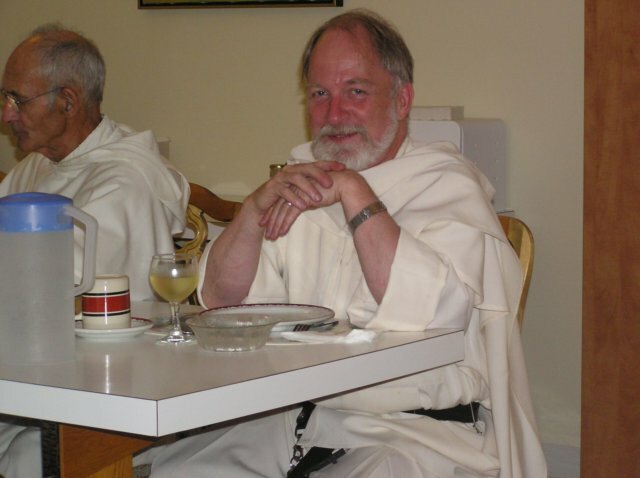 A great story of monastic adventure may be found at Roman Catholic Vocations blog.